The art of prayer, you dispatched in life. Saint Nikephoros the Monk, also known as the Hesychast, is known to us from the life of Saint Gregory Palamas, who had Saint Nikephoros as a teacher and guide. According to Gregory he was ‘an Italian’ who converted from Catholicism to Orthodoxy. This could mean that he was of Greek descent, from Sicily or Calabria, but whose family had been forced into union with Rome, or it could mean that he was an Italian of mixed Greek and Italian parentage. This we shall never know for certain. However, we do know that when he came to Constantinople, Nikephoros opposed the Unionist policies of Emperor Michael VIII Palaeologos (1259-1282) which were later agreed upon at the Synod of Lyon in 1274. Because of this, he was imprisoned in 1267-8 and later wrote an account of his ordeal. Moreover, by his stand for Orthodoxy, he won many disciples among the elite of the Imperial Capital. After this period, Nikephoros left for Mount Athos, where he became a monk and lived in a hermitage near Karyes, the Athonite capital. Here he dwelt in "quietness and stillness", according to Palamas, and eventually he withdrew to the "most isolated parts" of the mountain. Here he wrote a booklet called ‘On Watchfulness and the Guarding the Heart’, which made him famous as a hesychast, and on which veneration for his memory is founded. This work is in fact an anthology of quotations from earlier hesychasts, ascetic saints and fathers, such as Saints Anthony and Makarios the Great, John Climacus and Symeon the New Theologian. In his work Nikephoros recommends particularly the importance of having a spiritual father and giving him obedience. This, he says, is essential if we are to guard the heart from distractions and achieve unceasing prayer by calling on the name of Jesus Christ and asking for mercy. He also recommends as an aid for beginners the technique of breathing in and out as the Prayer is said. Nikephoros can therefore be seen to have assimilated the hesychast spirituality, typical of the thirteenth century, which had been inherited from the long hesychast tradition from the first century on. Moreover, it was on the basis of such Christian experience, including that of Nikephoros, and on the basis of his own personal experience, that in the fourteenth century Gregory Palamas wrote his ‘Triads in Defense of the Holy Hesychasts’. Gregory wrote: "Seeing that many beginners were incapable of controlling the instability of their intellect (nous), even to a limited degree, Nikephoros proposed a method whereby they could restrain to some extent the wanderings of the imagination." The "method" in question is closely similar to the psychosomatic technique recommended in 'The Three Methods of Prayer', attributed to Saint Symeon the New Theologian. Nikephoros is sometimes styled the 'inventor' of this bodily 'method', but Palamas does not actually assert this. So valuable was Nikephoros’ text that it was later included in the Philokalia. As we said, the main theme of this text in the Philokalia is ‘nepsis’ (Greek: νήψις) which is usually translated as watchfulness, wakefulness or vigilance. For those inexperienced in prayer and spiritual self-control, the intellect (nous) tends to wander and lapse into the imagination. 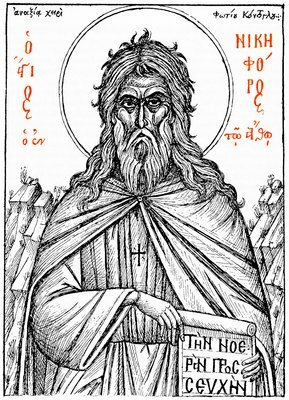 Nikephoros described a method of breathing while praying to concentrate the intellect (nous) within the heart in order to practice watchfulness. By doing this we become cleansed of our passions, acquire virtues, and this leads to our deification. Nikephoros specifically taught: "Gather your nous and force it to enter into the heart and remain there. When your nous is established in the heart, it should not remain empty, but allow it to continually perform this prayer: Lord Jesus Christ, Son of God, Have Mercy On Me. Never allow it to be silent. Because of this, the entire chain of virtues will enter into you: love, joy, peace and all others, because of which your every petition to God will be fulfilled later." Saint Gregory Palamas concedes that Nikephoros has written "in a simple and unsophisticated manner". Statements about making the intellect (nous) descend into the heart, Palamas insists, are not to be interpreted literally, for our mental (noetic) faculties are not located spatially inside the physical heart "as in a container". But there is none the less the genuine correlation - what has sometimes been termed a relationship of 'analogy-participation' - between our physical modalities and our mental or spiritual state: "After the fall our inner being naturally adapts itself to outward forms." Nikephoros was therefore correct, Palamas concludes, in suggesting specific ways whereby our bodily energies can be harnessed to the work of noetic prayer. Our most venerable Father Nikephoros, who ran the course of spiritual combat on holy Mount Athos, flourished a little before the year 1340. He was the guide and mystagogue of Gregory (Palamas) of Thessaloniki in the sublime teachings of the ascetical philosophy, as Gregory himself testifies. Occupying himself solely with hesychia free of cares and thus united within himself, he was ineffably united to that which is above the world and the highest of desirable things, by which he received blessedness in his heart through the light of essential grace. Having opulently filled himself, first of all, with the deifying gift and the imitation of inimitable deification, the blessed one, like a father, generously and without envy allowed us to share in it also, if of course we wish to be made worthy of gifts equal to his. In this work he has gathered from the biographies of the Saints all the references that describe watchfulness (nepsis), attention, and prayer, delivering from himself also the method which no one could have imagined to be better, namely the natural and truly wise method of gathering the nous within the heart by means of breathing, and at the same time invoking the Lord Jesus. Thus he made sacred watchfulness a fixed rule and set up for all those wanting to be saved a ladder of pure and undisturbed prayer along with the good things that spring forth from it, for he was the first, like a new Bezalel (Ex. 36:1), to construct it with the skill of the Spirit. Ascend therefore, ascend, however many of you desire to have Christ live in you and wish to be transformed into the image of the Holy Spirit, proceeding from glory to glory (2 Cor. 3:18), and then you will be deified and made worthy of the splendid portion of the saved.